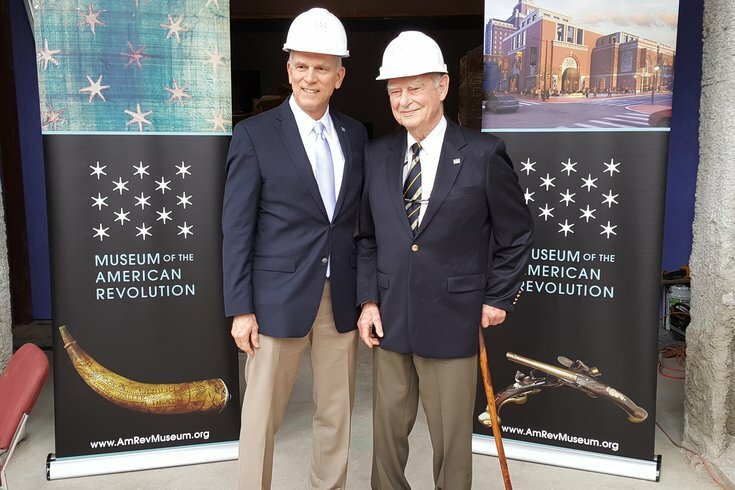 President CEO of the Museum of the American Revolution Michael Quinn, left, with Gerry Lenfest, right. Prominent Philadelphia philanthropist and local media owner, H.F. "Gerry" Lenfest, has died according to the Inquirer. Lenfest was reportedly taken from his home on Rittenhouse Square to Presbyterian Hospital where he was pronounced dead Sunday morning, a spokesman for the family told the newspaper. The cause of death has not been reported. He was 88. Lenfest, alongside his wife Marguerite Lenfest, have been prominent public figures in Philadelphia through their work in the media and charitable causes. Both Gerry and Marguerite serve on the boards and have donated to many prominent organizations in the city — including the Curtis Institute of Music, the Museum of American Revolution, Temple University's board of trustees, the Pennsylvania Academy of the Fine Arts and the Philadelphia Museum of Art. The couple established The Lenfest Institute for Journalism in 2016, a nonprofit organization, which would eventually become the owner of the Philadelphia Media Network (The Philadelphia Inquirer, Philadelphia Daily News, and philly.com). Mayor Jim Kenney issued a statement on Lenfest's death, calling him a "Philadelphia giant."